Emerald is considered an expensive gemstone. Most of the Emeralds have cracks, which reduces their value. A pale shade is not as valuable as is the emerald having deep velvet green to having a shade of grass green. It is difficult to find a flawless Emerald. A good Emerald is smooth and transparent and emits bright rays, and is without any dots or spots, this type of stone is considered most auspicious gemstone. An Emerald of good quality and without blemishes gives good health, a strong body to its wearer. Apart from this, it also makes him wise and intelligent. It increases wealth and property of the wearer and blesses the native with children. It gives protection from the bites of snakes, it also protects native from evil. It is also considered beneficial for good eyesight. It ensures safe and painless delivery for pregnant women. An Emerald, which is blemished causes injuries, deprives happiness from parents, causes mental and physical distress to the wearer. Emerald is ruled by Mercury. Natives having mercury as obtaining lordships of auspicious houses will do very well if they wear emerald. If Mercury is badly disposed or is inflicted by, conjunction with or aspect by malefic planet then emerald will neutralise the evil effect of such adverse influences. Suitability of Emerald Gemstone According to All Ascendants (Lagnas). For the Aries (Mesha) Ascendant Mercury is lord of two malefic houses the third and sixth. The natives of this Ascendant should not wear Emerald. Emerald can be used in the major period of Mercury if it is in his own sign in the third or the sixth house. For the Taurus (Vrish) Ascendant Mercury is lord of the second, the house of wealth and the fifth a trine. Mercury is, therefore, a auspicious planet for the Taurus ascendant natives. Natives of this ascendant will be well advised to wear Emerald with advantage. It will help in acquiring wealth and the native will be blessed with children, intelligence and good fortune. The beneficial results will become more pronounced in the major period and sub-periods of Mercury. Wearing an Emerald with Diamond, the gemstone of Venus, the lord of this Ascendant and a friend of Mercury, will magnify the good results. For the Gemini (Mithuna) Ascendant, Mercury is the lord of the Ascendant and the fourth house. The natives of this Ascendant should always wear Emerald as a protective charm. This will provide them with good health, wealth, longevity, lands, domestic happiness, education, and life without obstacles. The beneficial results will be more pronounced in the major period and sub periods of Mercury. If Mercury be in his own sign in the Ascendant or the 4th, such a disposition will give rise to a very favourable yoga known as Bhadra yoga. For the Cancer (karka) Ascendant, Mercury is lord of two inauspicious houses, the third and the twelfth. Moon, the lord of this Ascendant, is an enemy of Mercury. For these reasons, natives of this ascendant should not wear emerald. If Mercury is in his own sign or in the third or twelfth house then emerald may be used in maha dasha of mercury. For the Leo (Simha) Ascendant Mercury is the lord of the second that is house of wealth and eleventh which is house of gains. A native will get harmony in his family, substantial financial gains, name and fame If he or she wears an Emerald in the major period of Mercury and his sub-periods. For the Virgo (Kanya) Ascendant, Mercury is the lord of the Ascendant and the tenth house. 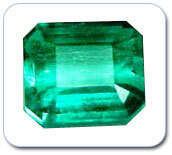 Emerald will shower good health, success and advancement in profession and name, long life, fame and honour. If Mercury is any way afflicted or inauspiciously placed in the birth chart, wearing of emerald will negate the malefic effects of such disposition. For the Libra (Tula), Ascendant Mercury is the lord of the ninth, which are house of Bhagya and the twelfth. As ninth house is a trine or trikona, native will benefit if he wears an Emerald in the major or sub-periods of Mercury. As lord of the ascendant Venus is a friend of Mercury it will prove very beneficial if an Emerald is worn always alongwith a Diamond. For the Scorpio (Vrischika) Ascendant, Mercury is the lord of the eighth and the eleventh houses. Consequently, mercury is considered an inauspicious planet for this Ascendant. Even then if Mercury as lord of the eleventh house is in the Ascendant, 2nd, 4th, 5th, 9th, 10th, 11th, wearing of Emerald in the major period or dasha of Mercury will help native to acquire wealth and he or she will gain financially from his or her profession. For the Sagittarius (Dhanu) Ascendant, Mercury is the lord of the seventh and tenth house. In this case, Mercury suffers from Kendra-adhipati dosha because of his lordship of two Kendras. Even then if Mercury is in the Ascendant, 2nd, 4th, 5th, 7th (in his own sign) 9th, 10th, (in his own sign) and 11th, wearing of Emerald in the major dash or period of Mercury will prove beneficial. Wearing of Emerald will help the native to overcome his difficulties is profession If Mercury (as lord of the 10th) being disposed in 6th, 8th or the 12th. For the Capricorn (Makara) Ascendant, Mercury is lord of the sixth and the ninth. In the ninth, which is a trine, falls the Moola Trikona sign of Mercury. Consequently wearing of an Emerald will be beneficial to the native of this Ascendant, particularly in the major and sub-periods of Mercury. As Mercury is a friend of Saturn, the lord of this Ascendant the Blue Sapphire can be worn by the natives of the Capricorn Ascendant. For the Aquarius (Kumbha) Ascendant, Mercury is lord of the fifth and eighth houses. As mercury is having lordship of fifth house, which is a trikona, it is an auspicious planet for this ascendant. The lord of this Ascendant Saturn is a friend of Mercury. Consequently, If Emerald can be worn with Blue Sapphire with beneficial effect. For the Pisces (Meena) Ascendant, Mercury is lord of the fourth and seventh houses. Mercury here is in occupation of two kendras and also suffers from Kendra-adhipati dosha. Even then if Mercury is in his own sign in the fourth or seventh or be in the 2nd, 5th, 9th, 10th or 11th houses, Emerald may be worn with profit in the major and sub-periods of Mercury.